My friend Rachel (runnerstales.com) passed along a day where food bloggers dedicate their blog to a growing problem in our country - child hunger. No child should go hungry in America, yet 1 in 4 U.S. kids don't know where their next meal will come from. Food Bloggers Against Hunger was created in response to the new documentary from Participant Media, A Place at the Table. On April 8, 2013, over 200 food bloggers will donate their posts to raise awareness about the film, issues of hunger, and ask their readers to send letters to Congress to protect SNAP funding and make anti-hunger legislation a priority. Eating healthy can be expensive if you do not plan out your shopping trip. When I was a teenager, I was a cashier at Publix. I remember like it was yesterday when a parent using foodstamps would buy $1 frozen pizzas and other junk items. It is sad when a family can buy 3 processed frozen pizzas for less than a bundle of asparagus. Please take less than a minute of your time and join Share Our Strength's call to action by sending a letter to the Congress to help. Click here to help. For my recipe, I made a pot of Pho Ga (Vietnamese chicken noodle soup). This is my comfort food and loved by everyone. Plus, using the below method, you can make it quick. This recipe cost me $11 to feed a family of four. 1/2 a rotisserie chicken. You can have the deli cut one in half for you - the one I picked up was only $3.50 & I had enough left over to make fresh spring rolls! Saute onions in a bit of oil. Add the chicken broth and the pho spice seasoning. Bring the broth to a boil and simmer for 30 minutes, skimming the top of the broth for the residue from the spice package. Meanwhile, shred the chicken. Once the broth has cooked for 30 minutes, reserve 2 cups. Combine the additional broth with the chicken, hoisin and sriracha. Bring the reserved 2 cups back to a boil and cook the rice noodles. 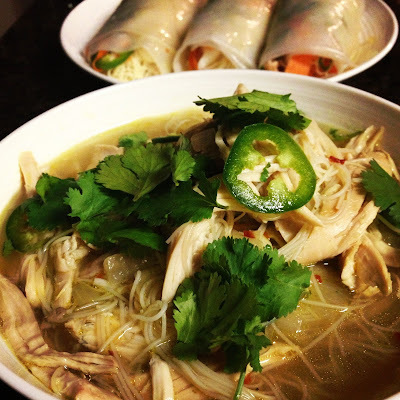 Combine cooked rice noodles to the soup and top with fresh cilantro and sliced jalapenos to taste. Make sure you visit Food Bloggers Against Hunger to see the 200+ budget friendly recipes. This is so great that you posted about this! I didn't know, otherwise I would have made a recipe and post happen for today. Instead I'll share a bunch of posts from fellow bloggers to get the word out! BTW, that Pho looks just like the kind from Thai Temple! I can't wait to make it!